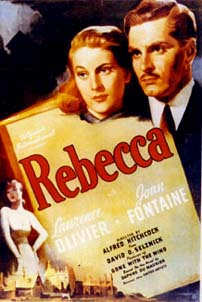 After a young woman falls in love and marries a rich widower in Monte Carlo, they go home to Manderley in Cornwall, where the 2nd Mrs. de Winter discovers that the late first wife still has influence over the household, especially the housekeeper who is bent on driving this Second Mrs. de Winter crazy. The cast includes: Laurence Olivier, Joan Fontaine, George Sanders, Judith Anderson, Gladys Cooper, Nigel Bruce, Florence Bates, Leo G. Carroll, C. Aubrey Smith, and Reginald Denny. Screenplay by Philip MacDonald, based on novel by Daphine Du Maunier.